Step 1. Pick a tire! Step 2. Select your tools! 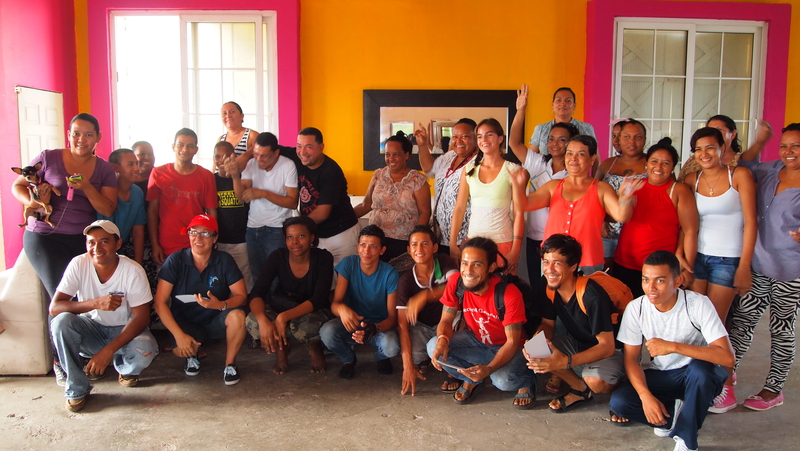 As if cleaning the beaches of the Bay Islands wasn’t enough, the folks from the Bay Islands Coastal Cleanup (BICCU) organized a Recycled Art Workshop during the first week of September, where they hired the services of two Honduran artisans who set up a vigorous art class with a heavy dose of environmental responsibility. Their main focus was on the three R’s of environmental protection – Reduce, Reuse and Recycle – with the spotlight on the REUSE part of the formula, where eager participants learned how to manufacture useful decorations made from worn-out rubber tires. This workshop not only gave local residents something relaxing and entertaining to do for a few days, but it also provided the participants with the opportunity of learning a new craft with the prospect of even creating their own micro business. It was also the perfect opportunity for them to understand the importance of minimizing wastes which would otherwise end up in the municipal dumpster or on a vacant lot somewhere. This is the first of hopefully many environmental activities to come, organized by the BICCU initiative, a Go Blue Central America member in the Conservation Action category. Dawn Hyde is the founder of this grassroots movement which aims to create awareness about conservation issues in the Bay Islands, and in particular in the island of Roatan, a much needed necessity that goes hand in hand with a thriving tourism industry. Birds of all species started popping up everywhere! BICCU was responsible for bringing Omar Hernandez and Ilich Moradero, two artists from La Ceiba who joined forces since June of this year to teach similar courses in schools, universities, the Honduras Naval Academy, and even at a Honduran penitentiary. They came to Roatan to teach this Recycled Art Workshop with a clear message… they want to spread the word about the 3 R’s and give continuity to these types of initiatives. For three days, they shared their passion for recycling as well as their skillful craftsmanship and creative prowess to instruct and inspire close to 30 local residents to construct colorful flower pots in the shape of tropical birds and large flowers, lounge chairs with an interlaced back support, and a decorative trashcan with closing cover, all made from old tires. Illich and Omar, followed by Dawn (from left to right). The work in progress can be seen throughout the pictures with the final results looking very impressive to say the least! This event could not have been possible without the collaboration of several sponsors and local institutions. Among them, the Port of Roatan, Parrot Tree Plantation, The Galaxy Wave Ferry service, the Municipality of Roatan, The Rotary Club of Roatan, and The Bay Islands Chamber of Commerce among others, all of which lent a hand in the execution of this workshop. 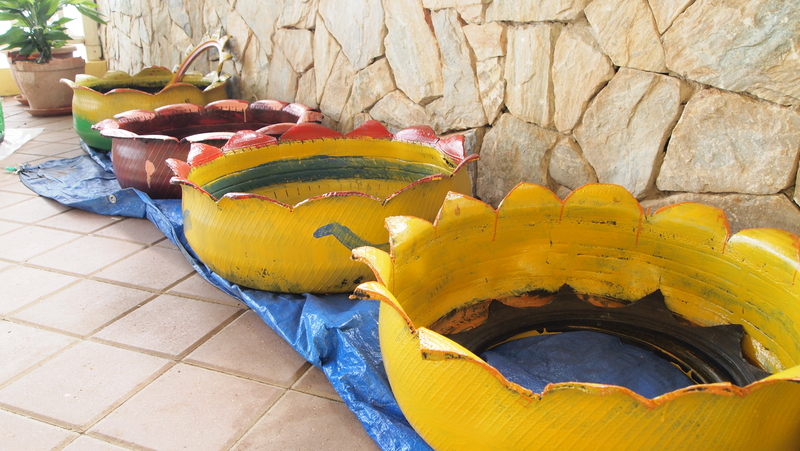 The final product – a reused tire converted into a pretty looking flower pot. Just add some compost mix and seeds, water consistently, and wait for the flowers to grow. Organizers, instructors, and participants can all agree that BICCU’s Recycled Art Workshop was a total success. Congrats to everyone! Dawn hopes to one day follow up this activity with a new project, where instead of reusing worn out tires, the raw material of choice will be wooden pallets which will be reused to create a very useful item which is always scarce – TRASHCANS!